Graphene is amazing. Or at least, it could be. Made from a layer of carbon one-atom thick, it's the strongest material in the world, it's completely flexible, and it's more conductive than copper. Discovered just under a decade ago, the supermaterial potentially has some unbelievable applications for us in the not so distant future. All of these are just hypothetical at this point, but could be real before we know it. And they're all flippin incredible. Mega-fast uploads. We're talking a whole terabit in just one second. Plug your phone in for five seconds and it would be all charged up. The downside here is that you won't be able to use a dead phone as an excuse anymore. What if we actually had a clear solution for cleaning up the tainted water near Fukushima? Scientists at Rice say graphene could potentially clump together radioactive waste, making disposal is a breeze. It could improve your tennis game, thanks to special racquets from HEAD that aim to put the weight where it's more useful: in the head and the grip. Water, water everywhere and EVERY drop drinkable. MIT minds have a plan for a graphene filter covered in tiny holes just big enough to let water through and small enough to keep salt out, making salt water safe for consumption. Touchscreens that use graphene as their conductor could be slapped onto plastic rather than glass. That would mean super thin, unbreakable touchscreens and never worrying about shattering your phone ever again. Just a single sheet of graphene could produce headphones that have a frequency response comparable to a pair of Sennheisers, as some scientists at UC Berkeley recently showed us. 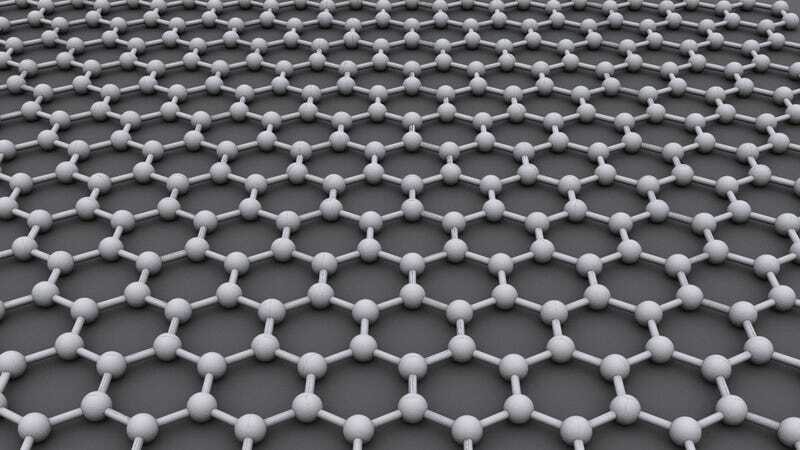 High-power graphene supercapacitors would make batteries obselete. Graphene could pave the way for bionic devices in living tissues that could be connected directly to your neurons. So people with spinal injuries, for example, could re-learn how to use their limbs.